Do Families in Red or Blue States Have Greater Stability? Do Families in Red or Blue States Have Greater Stability? What a Study Found. Contrary to what has been accepted as conventional wisdom, America’s red counties have a higher percentage of stable families than those in blue counties. According to a study from the Institute for Family Studies, red counties tend to have more married adults, more children born within marriage and higher levels of children living with both biological parents than blue counties. Wilcox acknowledged in his report some of the most stable families do come from blue states, such as Massachusetts and Minnesota, and that, indeed, the most stable families exist in the most extreme red and blue states. But Wilcox said the state-level data addresses only part of the equation because it does not explain the “connection between family stability and political culture” at the local level. “At the local level, red counties typically enjoy somewhat stronger families than do blue counties on at least three measures worth considering: marriage, non-marital childbearing and family stability,” Wilcox wrote in the report. “The bottom line: The marriage advantage in red America helps explain why children in red counties are somewhat more likely to enjoy stable families than are children in blue counties,” he added. Wilcox acknowledged there was no “overwhelming advantage” here, but he said it does dissolve the notion that blue states produce greater family stability. He said blue states achieve this through education and delayed parenthood, but red states have marriage on their side contributing to family stability. 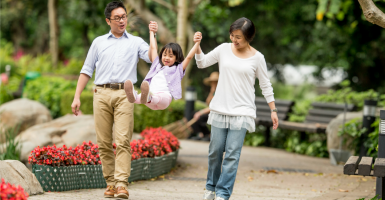 Likewise, Rachel Sheffield, policy analyst for the Heritage Foundation’s Institute for Family, Community and Opportunity, said marriage does play a critical role in family stability and helps children succeed. Furthermore, children born in married families are less likely to raise their children in poverty.